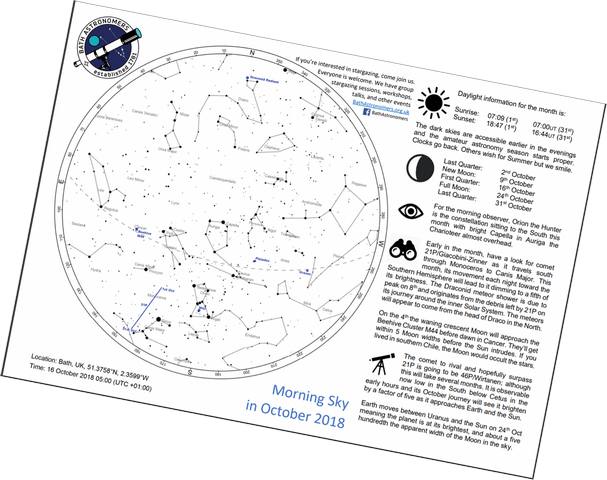 October brings us darker skies and more importantly it brings them earlier; especially with the clocks moving from British Summer Time back to Universal Time at the end of the month. Our stargazers guide is intended to help you get out and looking up. This month promises the opposition of Uranus and a close-ish encounter between Jupiter and Mercury. Comet 21P/Giacobini-Zinner is still with us in binoculars and later in the month it’ll be a telescope object before it recedes to the Southern Hemisphere skies.